The founder of the Oregon Indian Medicine Company was one Tho mas Augustus Edwards, born in 1832 in Saugerties, New York. At seventeen Thomas left home to go to sea, where he worked at the whaling trade. Upon returning he worked as a grocer until he met John Robinson, a professional circus man. Around 1855 Edwards became me business manager of the Spaulding and Roger's Circus. In 1857, he joined with General Albert Johnston on an expedition to Utah to help with the difficulty with the Mormons. He was at Pike's Peak in 1858 and then returned East to work for the Memphis Transportation Company until the outbreak of the Civil War. Entering the ranks of the Secret Service, he operated behind enemy lines as a spy for the Union Army, was captured, and would have probably been shot, had he not escaped. Having earned the rank of Colonel he worked in Arkansas as a scout for General Steele. In 1866, still employed by the Secret Service, he traveled to Oregon during the Snake Indian War. It must have been in Oregon that the idea for Indian Medicines came to Colonel Edwards, for when he returned East again, he brought with him a band of eighteen Indians of the Warme Springs Tribe. In 1874, he and the band of Indians, the Heroes of the Lava Beds, traveled around Europe putting on displays of Indian skills and customs. He returned to Philadelphia m 1876 and was an unofficial part of the Centennial Exposition. It was at the Exposition that Edwards claims to have introduced the medicines. In the fall of 1876, Edwards with his brother, Alfred Edwards, organized the Oregon Indian Medicine Company with headquarters in Pittsburgh. No records of the business could be found in the Pittsburgh directories. At first, the medicines were sold to the public in raw form, to be compounded at home. Edwards maintained that the company did not do well at first because the medicines, sent East from Oregon, were compounded carelessly and did not bring satisfaction. For several years the Colonel took up with John Robinson, the veteran showman trying to sell the medicines at his Indian shows. According to the advertising, in the early 1880's, while in Boston, Edwards was shown by a chemist how to prepare the remedies so that they could be bottled. Around 1882 grounds for erecting laboratories were purchased in Corry, Pennsylvania. Corry was chosen as the site for the factory because of its central location and existing railroad facilities. The factories took up an entire city block and in front of several of the buildings the grounds were paved with bricks embossed with the words Ka-ton-ka. By 1885 the factories at Corry were operating at full scale production. Edwards claimed that his partners in the manufacture of the medicines were Dr. William C. McKay and his brother, the famous Indian fighter, Donald McKay. Although no documents could be located to prove or disprove his story, Edwards made great use of his name in the advertising and promotion of the products. Supposedly, Donald McKay was the son of a Scotsman, Alexander McKay, and his Iroquoi bride. Donald achieved his greatest victory over the Modocs as an Indian fighter. He married a woman of the Nez Perce Tribe, Minnie McKay, and his people were the Warme Springs Indians, who regarded him as a medicine man. Accordingly, he associated himself with Edwards for the purpose of introducing to the public, real Indian medicines. He would have his people gather the remedies at the proper season and then have them sent East to his partner. Edwards employed a number of successful means to sell the remedies. 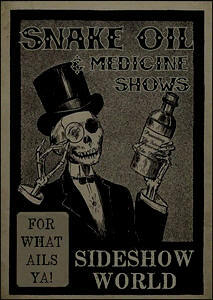 He kept the medicine shows going through the turn of the century and hired Indians to hawk the remedies on the streets. He printed a newspaper called The Ka-Ton-Ka Story and a paper back booklet The Last War Trail of the Modocs, in addition to other printed material Colonel Edwards retired from active participation in the management around 1901 and left the business in the hands of a man named Claude D. Place, who was president and general manager for a number of years. When Edwards died in December of 1904, the company was carried on by his daughter, Mrs. Daisy Van Vleck, until the firm was sold to Jerry Frantz around 1912. Frantz had worked for the company and managed the medicine shows for several years.